Today is the first day of school for Joe (2nd grade) and Charlie (1st grade). To say the boys were excited about today is an understatement. How wonderful it is to have kids excited about going to school. If this year is anything like last year, their excitement will last all year long. ❤ this pic!!! Good luck to the boys for a fabulous year! They did have a great day, Georgette. I know they’ll have a great first day. My kids are beyond excited for theirs too! Isn’t that a great thing, Darla? When do your kids start? August 29th. Christian has the same teacher and kids in his class as they do a teacher rotating thing every two years (which I think is awesome) Julia will be in school full days for the first time. It’s going to be a huge change for everyone. Are you prepared to have Julia in school for a full day? Oh, I love Montessori schools! They are wonderful. I am not prepared to say goodbye to Miss J. I think I’m going to cry. We’ve been together for almost six years, y’know? It’ll be very bittersweet. But it’s time. Good to know your boys had a great day! Brings back such great memories of my kids’ Back to School days. 1st and 2nd grade??!! How did THAT happen so soon? I know… This stage goes way faster than the first 2yrs, in my opinion. It’s nice to see kids so excited about going to school. My niece and nephew are totally over it by now! 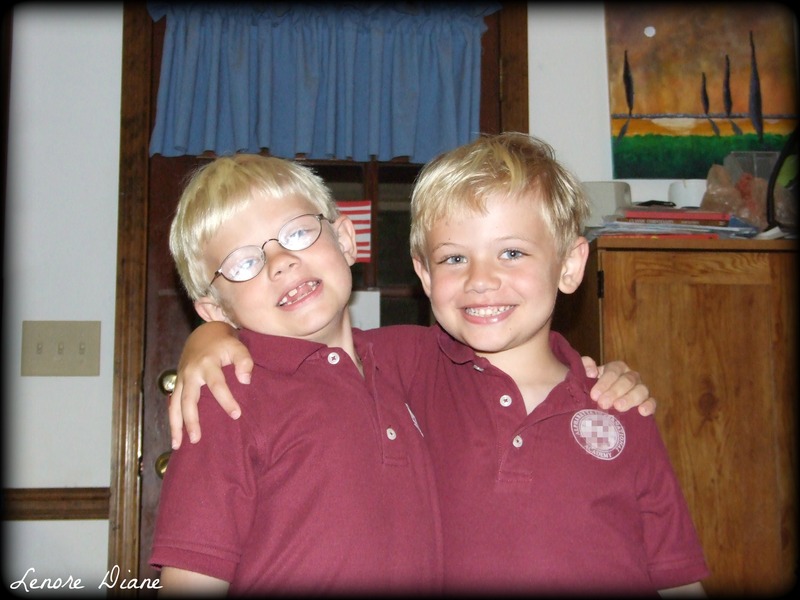 Photos of your boys always bring a smile; they’re so happy … aaand happy about school, you’re a lucky mom. It seems like a good day for getting back into the swing of things! Or trying, anyway! Wishing Joe and Charlie better luck than I seem to be having! Not that they look like they need it – they look happily ready to go!!! It is so good to see you back, SIG. I’ve been out of the blogosphere (reading-wise) for several weeks. It is nice to read and interact again. Back to school already??? Yikes! Good luck this year to those little cuties – watch out, world! Yes. And not a day too soon! Noah has always always looked forward to the first day of school BUT he is a bit of a social…not butterfly because he is a boy…social SHARK. Charlie, too, and he is only in 1st grade. HELP!! It seems school starts early this year. Glad the boys are looking forward to it! Thank you, Hellboy. You’ve got some fantastic photos on your page. Absolutely beautiful! I can’t believe school is starting already in some areas. Seems way too early. I hope those sweet boys will continue to love school for a very long time. Already? eGads! They are adorable. Glad they’re looking forward to it. I’m just lamenting that another season has slipped away. Well, not quite, here. It’s still hot as blazes and them thar hills are burning like a tobacco stash.